Looks like Las Vegas just got even stranger! ZZ Top will be performing in Las Vegas. The musician is headlining the tour, alongside The Kenny Wayne Shepherd Band. Dressed in some “cheap sunglasses” (I love that song), ZZ Top plans to rock out at the Casino Resort, blasting songs such as “Gimme All Your Lovin’”, “Sharp Dressed Man,” and hopefully “Viva Las Vegas,” which would only emphasize the concert since, after all, it is being hosted in Vegas! ZZ Top is a known American rock band. Having formed in the late 60s in Houston, Texas, the band consists of bassist as well as lead vocalist named Dusty Hill, guitarist and the lead vocalist Billy Gibbons, and drummer Frank Beard. This band has been hailed by critics and fellow musicians for having a strong mastery on rock music. The group was even complimented by Cub Koda: “As genuine roots musicians, they indeed have few peers; Gibbons is one of America’s finest blues guitarists currently working in the arena rock idiom. On the other hand, Hill and Beard provide the ultimate rhythm section support.” Strong words from a very tall man. 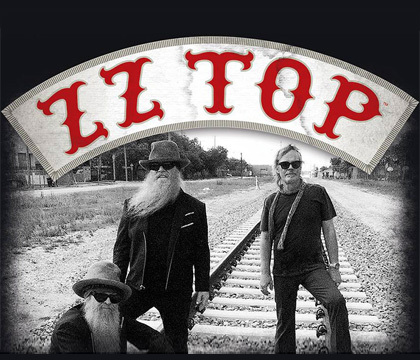 Since the release of their debut album in January of 1971, ZZ Top has become known for strong roots in blues and rock. You can expect the standard that is ZZ Top. Having never been a fan, I had to take a peak. I watched a YouTube video of a live performance and man, was I blown away! At this concert, you can expect what you would any day or time with the band: long, macabre beards and guitars screaming, one would be wise to carry a pair of ear plugs with you – unless you are like me, where the louder the music, the happier I am! Their choice of venue could not be more perfect. Skulls lining the stage, all three musicians will be on stage jamming out to their favorite songs. They have had quite some time to develop a genre unto themselves, so what to expect? That is the fun part: no one knows! ZZ Top is known for mixing it up. Never throwing the same two elements your way at any given time, from beginning to end you are consumed in the world of three great rock and blues icons. Expect to see a lot of beach balls bouncing around. I cannot say I am into this kind of music; my roots are more along the “Metal” end of the spectrum that is the rock world. However, I could see this concert playing out perfectly, orchestrated with utmost quality and a desire to please their fans. Even if they were to not please their fans, I have a feeling ZZ Top in Las Vegas will blow minds and shatter windshields in the outside parking lot. Bring duct tape with you. It could not be more perfect that they are performing in Las Vegas, huh? Well, ZZ Top has some history in this city. Having done over 40 tours across the nation (and the world), Las Vegas seems a textbook place for a band that focuses on great entertainment rather than banter. Whether you know their music or not, you have to admit that there is something catchy about it. Those blues make you want to sway and move, so prepare for some close encounters with a group of rock icons, returning to the stage after a three-year period without touring at all. The reason was not personal, don’t worry. Keep in mind that this band has been around for decades, and they have this down to an art (or even a science!). The Pearl Concert Theater at Palms Casino Resort is quite large, and if I remember correctly (I’ve been there a few times myself), the acoustics are perfect. This is because the venue hosts everything from rock concerts to orchestras. I saw the Phil Harmonic here once, and I could not have asked for better sound quality. That is probably why ZZ Top decided to choose it: it is the best location for this kind of music. You want the cold lyrics and uplifting blues and rock guitar riffs to echo and sway off of the walls themselves. There are certainly many venues that could have been considered but let’s face it - it is an architectural marvel and coupled with its elegance, there could not have been a better venue choice. Well, water. Though whenever I go to a concert, they make you buy it inside of the venue (profit!). You might also want to pack a beach ball to toss around with your fellow rockers, and like I said: bring duct tape; something is bound to break! For those of you who want to preserve your hearing for decades to come, bring some ear mufflers or plugs. You do not want to miss the sounds, of course, but you must recognize the volume these guys play at. There is no “0-10” amplifier here; theirs goes up to “11” or perhaps “12”. So be sure you look out for yourself, and know that this is a crowd that does not incite violence or start mosh pits; you are safe. Just be prepared for a lot of noise, a lot of vibrating ground, and some great music! In conclusion, ZZ Top will be performing in Las Vegas on October 7th, 2016. I am sure tickets are already sold out. You should try to attend, as it will be a pretty rad event. However, do not feel like you are missing their last concert if you cannot attend. I have a good feeling that these guys will be back to rock Las Vegas to the ground. And always remember: safety first. Bring water (or money to buy water with), some easy ways to protect your eardrums, and your body. You will be swaying to that rhythm, blues, and rock for days to follow, and if you cannot attend, try to get there next time. Like I said, I know these guys; I’ve never been a fan but I have been exposed to them, and trust me, they will be back in no time!